An updated version of this hike is available HERE. It was a warm Christmas morning with temps in the mid 40’s and sunny. A perfect day for a hike. I wanted to do something close to home in order to avoid late afternoon holiday traffic. This seemed like a perfect fit, so off we went. I was not familiar with the layout of the property, but I did check it out on Google Maps. I don’t mind wandering because I always discover something of interest. I did not find a map until I sat down to write this. I decided to also check out Graff Sanctuary, which is right next door. 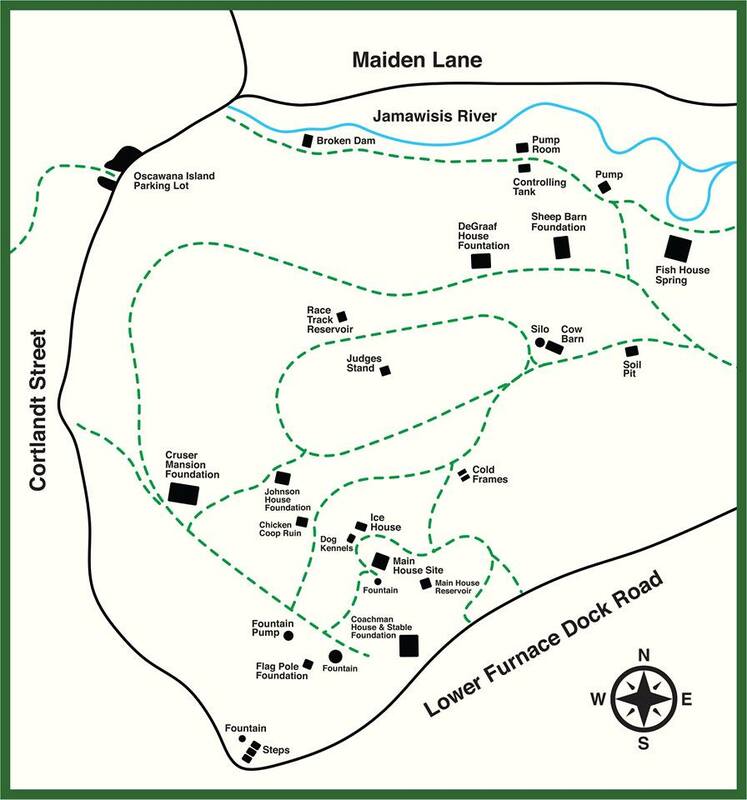 Graff Sanctuary is a 30 acre protected woodland ridge overlooking the Hudson River along Furnace Dock Road in the Town of Cortlandt. Graff Sanctuary was donated by Howard Graff to the National Audubon Society in 1975 with Saw Mill River Audubon responsible for sanctuary management. In 1991, ownership of Graff Sanctuary transferred to Saw Mill River Audubon. It has several well blazed hiking trails which interconnect, that total just under a mile. Parking is limited at the end of Briggs Lane, which is a dead end. Trail access is up a private driveway and to the left along a stone wall. Look for a red blaze on a tree near the base of the driveway. Once at the entrance, we proceeded on the red-blazed trail briefly, until we came to a t-intersection. There we turned left and started following the white-blazed tulip tree trail. The white blazed trail led us through the woods to an unusual stone structure. According to their website: The history of this stone structure at Graff Sanctuary is somewhat uncertain but it is believed to have been used for water storage as part of the Oscawana property on the other side of Furnace Dock Road. Shortly after passing the stone structure, we came to another t-intersection and turned left onto the blue-blazed river view trail. Unfortunately the name is deceiving. There isn’t any spot where you can get a clear view. Since the leaves are off the trees you can see the river, but in summer you won’t be able to see much. The river view trail veers away from the river and loops back through the woods, where it meets up with the white-blazed tulip tree trail. We passed by the stone structure again and also the t-intersection, where this time we turned right to continue on the white-blazed tulip tree trail. We followed the white blazes through the woods to its terminus on Furnace Dock Road. We turned left and began a short road walk. I wasn’t sure exactly where the McAndrews Estate entrance was, but I could see some ruined buildings through the trees. We crossed the road and sort of bushwacked towards the ruins. The McAndrews Estate (also known as Reusens Farm or Long View) is part of Oscawana County Park, located in the Crugers area of the Town of Cortlandt. It is owned by Westchester County and managed jointly via an intermunicipal agreement with the Town of Cortlandt. The 100-acre park is open to the public, and contains a number of ruins and hiking trails. The trails are well blazed and easy to follow, although prior to my visit, I had read the complete opposite and at the time I did not have a map. Upon entering the property, we walked atop a stone wall that took us up to where the main house site was, as shown on the map. The stone steps and curved walls are all that remain now, but it was pretty cool to see. The footprint of where the house stood gives you an idea of how big it was. On their website they have old photos of what it used to look like. After checking out the main house reservoir, we retraced our steps back to the main house site where we veered to the right and began to follow a yellow-blazed trail. I figured it had to lead somewhere if they took the time to paint the blazes on the trees. As we walked through the woods the yellow trail ended where it met up with an orange-blazed trail. We now started following the orange blazes, where we passed what looked like foundations of some kind, but are referred to as “cold frames” on the map. The orange trail led us to a road which was blazed white. We turned right onto the old estate road, following the white blazes. That brought us to a stone cow barn which was in pretty good shape. We walked around the back and discovered a lower level that was not visible from the front. I entered inside to get a better look. Just to the left of the stone cow barn, is a horse race track that is bordered with a steel pipe fence. After spending a little time capturing some images, we continued following the white blazes on the estate road. Not far from the barn was another stone structure. It is marked as “soil pit” on the map. After passing the soil pit, the white trail came to an end and a teal-blazed trail led off to the left. We continued on the estate road to see where it led. We passed a pond or lake on our left and I surmised that this road was leading us back towards Furnace Dock Road. I saw an unmarked woods road that passed by the lake, so we headed in that direction. I heard running water, so we headed towards the sound. There we saw an old dam with a nice waterfall cascading from it. We then retraced our steps back to the estate road and turned right onto the teal-blazed trail. It was very icy in this area and we had all brought our micro spikes along. Only problem was, I left mine in the car. To my credit, I didn’t fall at anytime throughout the hike, but came close several times. We walked the teal-blazed trail, which paralleled the Jamawisis River. It would have been a much nicer walk if I was wearing my micro spikes. The teal-blazed trail ended at Cortlandt Street, almost directly across the road from Oscawana Island. We crossed the road and proceeded past the gated entrance. We walked over another icy patch then turned right towards the kayak launch, where we took a short break. After our break, we returned to the main trail, heading towards the river. We came upon a massive fireplace and chimney off to the left in the woods. Near the chimney there was what I suspect are the ruins of a spring house. It is fenced off, but there is a gate. As we continued on the main trail, we reached the edge of the Hudson River. We stopped here and relaxed a bit as we took in the view. It was now in the high 40’s and the sun was shining bright. A glorious Christmas day along the Hudson. We continued walking along the edge of the river enjoying our hike, stopping briefly along the way to enjoy the scenery. We came to what appeared to be an old storage building. Shortly after passing the storage building, the trail seemed to peter out. We back tracked to the main trail and retraced our steps back to Cortlandt Street. We walked along the road, looking for a trail that led onto the estate property. We came to a driveway and headed up the hill, passing what I believe is an old ice house. We were now back on the estate road aka the white-blazed trail. As we walked along the white-blazed trail, we saw an odd looking ornate frame. I thought it might be a fancy foundation, but as I approached it, I realized it was a huge fountain. We continued on the white-blazed trail until we came to a junction with the yellow-blazed trail. I could see the main house site through the trees, so we turned left and walked up the stone steps towards the main house site where we were earlier. When we got to the top, by the main house site, we sat down and took another brief rest. From there, we retraced our steps back toward Furnace Dock Road. We reentered Graff Sanctuary, now following the white-blazed tulip tree trail. We turned left onto the red-blazed trail which climbed somewhat steeply and then leveled off. We followed the red blazes all the way back to the entrance, then walked down the private driveway to the parking area. Since I didn’t have a map during the hike, there were other buildings and foundations that I missed. I didn’t walk around the race track, which had some ruins, but I plan on going back now that I know the layout. I hope that you enjoyed my Christmas day hike and don’t forget to follow my blog. Feel free to comment and/or share this page with your friends. Now get out there and take a hike!